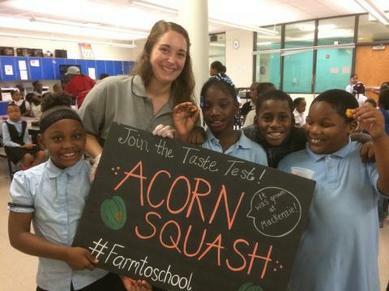 Detroit Public Schools Community District (DPSCD), a recipient of a 2015 Farm to School Planning Grant, celebrated National Fresh Fruit and Vegetable Month using innovation and culinary creativity. District Executive Chef, Kevin Frank, decided to tackle the nation's favorite salad dressing, ranch, by using strawberry and blueberry purées. The new salad dressings increase kids' consumption of more fruits and vegetables, while allowing them to experience new and exciting flavors. DPSCD students are exposed to various farm to school activities, which include accessing fresh produce which is grown in their own backyard at Drew Farms, a three-acre organic farm managed by 18 - 26 year old special needs students who attend Drew Transition Center vocational school. Learn more about DPSCD and their amazing farm to school activities! Through a new national investment by the W.K. Kellogg Foundation, three partner organizations are launching an effort to increase access to local, healthy foods for young children in Georgia’s early learning environments. The statewide public-private partnership will be led by The Common Market Georgia, Georgia Organics, and Voices for Georgia’s Children and Quality Care for Children. This Farm to Early Care and Education (Farm to ECE) initiative will offer hands-on education in nutrition, cooking, gardening and promotion of local, fresh foods in early care and education programs. Together, the partners will increase healthy food access for Georgia's most vulnerable children by encouraging family engagement, teaching children where their food comes from, and expanding market opportunities for local farmers to sell fresh foods to early care and education programs. “Educating our state’s youngest children to make healthy eating choices and ensuring they have access to nutritious foods is a tall order. Thanks to over ten years of dedicated farm to school work with K-12, we now have a clear road map and great partners to accomplish the work ahead,” said Alice Rolls, Executive Director of Georgia Organics. Part two of this Farm to Early Care Webinar Series explores how childcare providers can serve local foods while following best practices for food safety and CACFP compliance. Creating an appealing, high-quality Summer Meal Program menu is important to the success of your program and can draw more children to attend and gain the support of parents. Menus that include a variety of healthy food while addressing cultural preferences, can attract children and gain the support of parents. Other considerations that come into play as you design your menus are how to budget for the best quality meal and what to do about curbing waste. Hear from program providers on what they do to develop their summer menus, how they’ve improved quality, and how to get feedback from the children being served at sites. Presented by Food Research & Action Center. Team Up Thursday webinar, Team Up for Farm to School Success! FNS will host the June Team Up Thursday webinar, focused on best practices for planning and organizing successful farm to school programs. The Office of Community Food Systems (OCFS) will introduce the webinar by presenting farm to school concepts and reviewing available resources, such as the Farm to School Planning Toolkit and Grant Program. The webinar will feature schools and districts who have creatively utilized Farm to School Planning Grants to grow their program. Presenters will share their experiences on how to effectively plan, organize, and create engaging and meaningful farm to school programs. It's Time to Turnip the Beet! serving foods that are culturally appropriate. The summer months are the best time to serve local foods and the Office of Community Food Systems (OCFS) wants to recognize two Gold Turnip the Beet winners who have done an excellent job serving up local foods! Keep reading to learn more about these sponsors and check out the blog to learn about the 41 Silver and Gold Turnip the Beet winners. 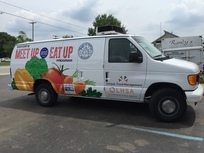 OLHSA, A Community Action Agency in Pontiac, Michigan, partners with Unique Food Management to provide local food for OLHSA’s Meet Up & Eat Up Program, delivering fresh, local summer meals and nutrition education to Pontiac’s youth. OLHSA uses evaluation criterion to favor bidders who have the ability to use and source unprocessed or minimally processed local agricultural products. Their summer menus feature fresh fruits and vegetables and the majority of these items come from Eastern Market Produce in Detroit, Michigan. Eastern Market works directly with local Michigan farmers to get the best produce at a reasonable price. All of the fresh fruit and vegetables are delivered to Unique Food Management, where it is assembled into summer lunch meals for disbursement. During the summer, they regularly order strawberries, raspberries, blackberries, blueberries, pears, peaches, watermelon, honeydew, cantaloupe, apples, broccoli, carrots, celery, corn, cucumbers, romaine lettuce, onions, tomatoes and peppers! Yum! Abilene Public Schools has a Farm to Summer program that features local food in summer meals as well as hands-on food, garden, and nutrition education. Director of Food & Nutrition Services, Kyleen Harris, says that in the summer, there are many opportunities to incorporate fresh, seasonal produce because fruits and vegetables are widely available from farms in the region – like watermelon or cantaloupe. 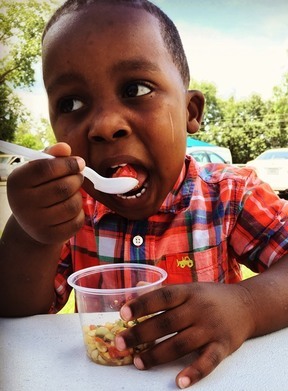 Abilene Public Schools collaborates with their county’s Extension office to conduct fruit and vegetable taste tests over the course of the summer growing season. Community gardeners in Abilene donate unique fruits and vegetables from the garden for cooking demonstrations. Many participants had never even seen a purple potato, let alone tasted one! Each year, children plant either a chive or cilantro seed at the beginning of the summer program. As they return each week, children water and tend to the young plants and watch them grow. This year, they plan to plant cilantro, basil, and mint under grow lights they received with the help of a grant. At the end of the season, they plan to use the cilantro in a salsa that will go with their summer meal.